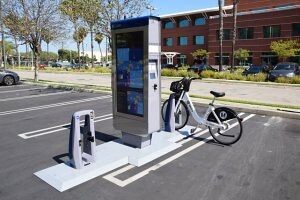 Step right up, first chance to test LA’s new bikeshare! Guess what #BikeLA? Bikeshare is coming to Los Angeles in Spring 2016! 1,090 bikes at 65 strategically located stations will transform the way we move around Downtown LA. What is bikeshare you ask? Bikeshare is a fleet of bicycles available for check out 24/7! Bikes can be picked up from one station and returned to any other in the system. It is an ideal way to get around and a new way to see LA! In the next two weeks, you will have an opportunity to join us to test out the bikes and give feedback about the proposed station map! We heard from many of you about your preferred station locations already but if you haven’t yet had a chance to give your two cents, come on by! We’re all ears! And yes, you will be able to test ride the bikes! There will be a demo kiosk, fully equipped with bikes. Did we say bikes? Bikeshare? Yes, we’re excited, we hope you are too! If you’re wondering who is coordinating these events, it is the all-star collaboration between LADOT + Metro + BTS (and their partners B-Cycle, Ridescout, Toole Design Group and BikeHub). If you are interested in learning more, stop by, give us a shoutout on Twitter and stay tuned for more updates! We hope you love #bikeshareLA! http://bike.lacity.org/wp-content/uploads/2015/04/tempBikeLogo2.jpg 0 0 LADOT Bike Blog http://bike.lacity.org/wp-content/uploads/2015/04/tempBikeLogo2.jpg LADOT Bike Blog2015-07-28 18:25:372016-04-06 18:12:59Step right up, first chance to test LA's new bikeshare!